I just wanted to share a picture of my latest cake, a 3-tier Calla Lily theme cake. I had fun creating this cake. I think that next time, I'll vary the sizes of the flowers and add a touch of lustre dust to it to brighten it up. I can't believe you made that cake! I am so incredibly impressed. You are truly talented. Whoever receives that cake is one very lucky person. WOW! This cake is so BEAUTIFUL! Beautiful cake, how elegant decoration, absolutely amazing. This is gorgeous! I'm sure the bride was thrilled! That is truly a work of art! 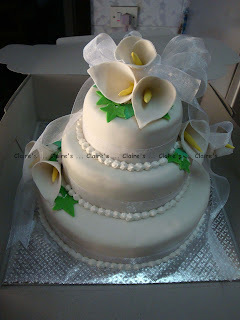 Callas are my sister's favorite flower - boy, she would LOVE that cake. What a wonderful cake. I love working with fondant and up to now I made a wedding cake for our best friends. I hope that you will share many of your creations with us. Thanks ... I'm looking forward to it too! What talent. The cake is very beautiful.